One of my favorite ways to study the Bible is through focused, repetitive reading. Today I’m sharing one of the methods I use for this type of study. 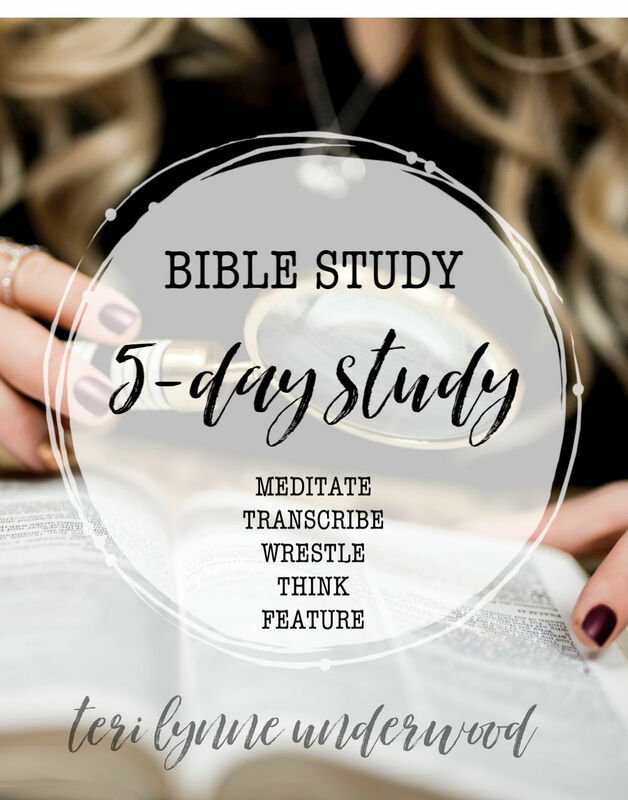 The 5-Day Study Method is another way to gain an overview books or larger passages of Scripture. But it can also be useful for repetitive studying of smaller passages or portions of Scripture. Spending multiple days looking at a passage helps us gain a deeper understanding of the passage. This is also a great method to use as starting point for a new study and to fill in with more detail throughout the study. You may also find this method valuable if you are studying through a book with a group by chapter or section. Take time to read through the passage or the whole book (if it’s shorter). As you read, underline or circle words or phrases that stand out. If you have time, read through the book in a couple of translations, noting the differences in wording. Write out the passage you are studying. This is helpful to let the words sink in deeper. Don’t worry about how neat or sloppy you write, this is an opportunity for you to spend some time thinking about the passage. Look over what you have underlined and what notes you made. Identify any phrases or ideas that stand out to you. Look up words you don’t understand and write out the definitions. Read any verses cross-referenced and add notes about what they reveal. Using study notes and commentaries, continue digging into the passage. Make note of new ideas or understanding you gain. Identify other passages connected to what you have read. What does this passage reveal about the character and nature of God? What does it reveal about the character and nature of man? How do you need to change in order to align yourself with the Lord? Are there sinful habits or attitudes you need to confess after reading? Take time to do so. How does understanding these things give you reason to be grateful? What in this passage leads you to gratitude? What are the main ideas in this passage? Summarize the passage in 2-3 sentences. This year, I’m studying John’s gospel. For the first six weeks of the year, I just read through this book over and over — usually a chapter or two a day. Now, I’m using the Reporter method we covered yesterday to begin filling in the details about this book and why it was written. I will probably spend a week or two researching and gathering this information. After that, I’ll begin using the method we’re covering today — the 5-Day study method. I’ll use this technique to work through each section of John’s gospel. It will likely take me four to six months to get through the entire book. Once I finish that, I’ll go back through the book reading three-to-five verses at a time using the 3 Rs method. I hope that helps you understand how these methods can all work together. While you may not be spending an entire year in one book, the same general practices can help you study smaller passages as well, blending each of these methods to gain a more complete grasp of the passage or book you are studying. So tell me, which of the methods we’ve covered seems most doable to you right now?